Announcement YoMeryl is an art + animation studio in Los Angeles, run by Bronwyn Lundberg and Sarah Zucker. YoMeryl is an art + animation studio in Los Angeles, run by Bronwyn Lundberg and Sarah Zucker. I am so happy with my Lesbian Last Supper! I’ve wanted it for a long time and I’m so happy to finally have my own copy! Pondering the essence of Clevergirl with Russell Brand... Pins are going fast, pick one up now from the YoMeryl shop! Jeff Goldblum knows you can never underestimate a Clevergirl! 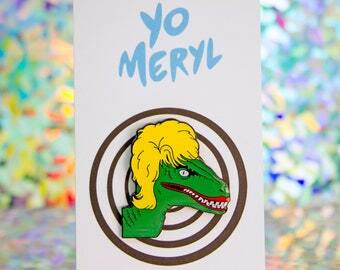 New Clevergirl Enamel Pins! First limited edition of 100, 1.25" soft enamel with epoxy. Ships worldwide... Get yours now! Sarah and Bron with their cat Ginny, and her evil twin Dinny. YoMeryl is an art + animation studio run by Bronwyn Lundberg and Sarah Zucker in Los Angeles. Contact us with inquiries and commissions at yo [!at] yomeryl.com. Bronwyn Lundberg (Bron) is an animator and painter based in Los Angeles, CA. Sarah Zucker is a writer, artist and Jeopardy! Champion based in Los Angeles. Hi Everyone! It is my goal to make sure your order is exactly to your liking. If you would like a personalized autograph for yourself or the receiver of the art, please ask! If the product is damaged, please e-mail me a photo of the item. I will issue a refund or send a replacement, whichever you prefer. Under no other circumstances do I offer refunds or returns. Once your payment has cleared via PayPal, I will package and set aside your order to be shipped within 1-2 business days. All products are shipped using the most reliable packaging techniques. This raises the shipping cost for both parties, but it's worth it! I haven't gotten a single complaint, and these items get sent around the globe.